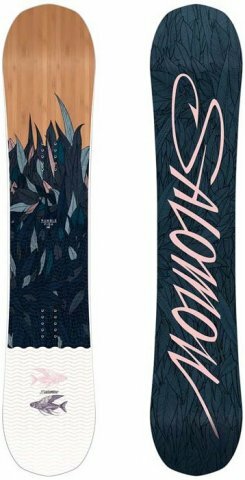 The Salomon Rumble Fish snowboard proved to be a really fun and interesting take on an all mountain freestyle board. It is a true twin with Salomon’s rock out camber profile (flat between the feet to camber underfoot to rocker on the tip and tail) and a medium flex that gives it enough stability for all mountain but just enough versatility for playing in the park as well. 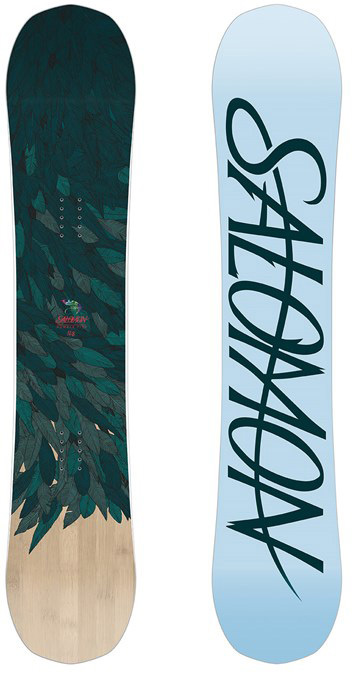 The Rumble Fish is a good board for those who want to ride centered always, even in powder. There is almost no room for set back on board so just keep that in mind if you are more of a directional powder rider. Flex/Buttering: It medium difficult to butter/flex, but that just means you get to have more pop off of jumps and into turns and such. On Snow Feel: The Rumble Fish has a very stable feel on snow, the flat camber between the feet helps you to feel stable and confident but you also have the camber under the bindings to keep the board feeling lively. Edge Hold: Salomon‘s EQ side cut makes edge hold on ice stress-free, it still has the feel of a normal sidecut but you get the extra help from the three straight lines that are incorporated into the sidecut without really noticing they are there. Turn Initiation: Turning is very fun and quick on the Rumble Fish, the camber underfoot helps make the board responsive in turns. Turning Experience: Very fun in small, medium, and large radius turns. Enough camber for higher edge turning but also easy to skid turns. Carving: Making carves was fun, it’s not the elbow dragging type carving board but you can definitely lay some trenches if you want. Speed: It’s a fast board with a sintered base that can hold it’s line when you decide to charge. and it isn’t super chattery like some freestyle specific decks can be. Uneven Terrain: The Rumble Fish felt fine in uneven snow, it’s quick to turn and nimble so big bumps aren’t a problem. And it is stable through chattery snow as well. Powder: For a true twin, this board rode great in powder. I think the mix of medium flex and the reverse camber in the tip and tail kept it afloat rather easy for a shorter board. It doesn’t have much room for setting it back, so this board is more for the rider that likes to stay centered all the time even in powder. Jumps: Really fun to jump around on, and stable enough for bigger kickers too. It also has carbon stringers to add more pop to the board for added liveliness, and spins on this board are fairly effortless too. Jibbing: I like this board profile for jibbing. The flat between the feet help it to feel stable on boxes, and the camber underfoot should help you lock into rails. It also has plenty of pop and is easy to spin for more technical tricks too. Pipe: Didn’t get to try it in the pipe, but I think it would ride great. The added edge hold from the EQ sidecut along with the camber underfoot should make for a stable and fun pipe board. We try to get as many images of the Salomon Rumble Fish, but forgive us if they're not all there.